At some point in our lives we all get our spiritual calling to embark on a Holy pilgrimage. It could stem from a pledge we make, an auspicious event in our personal life or simply, a need for spiritual fulfilment. You now have an opportunity of a lifetime to kick-start this New Year on an auspicious note. Take a trip to the holiest of festivals, the sacred Kumbh Mela. 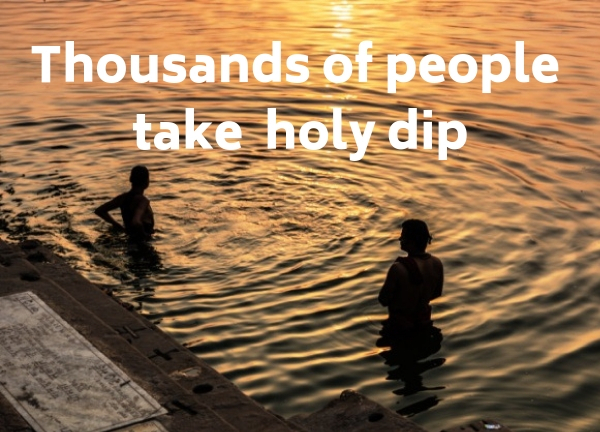 A Holy Dip could help you attain that Nirvana we are all seeking. Kumbh Mela (fair), is a mass Hindu pilgrimage of faith in which people from not only India but from across the world, gather to bathe in a sacred or holy river. The belief being that a holy dip will cleanse our sins and bring salvation. We are sure, the mere mention of it, instantly evokes sights you have all seen on a television show or some Bollywood movie. Scantily clad, ash smeared sadhus (Hindu holy men) performing miracles. Hordes of pilgrims from across the world dipping in the same holy waters. The air resounding with the chant of holy verses. This is a festival significant enough to be recognized by UNESCO as an Intangible Cultural Heritage. A symbol of peace and harmony with millions of pilgrims from across the planet converging to celebrate this festival together. The Kumbh Mela is an experience, like no other. As per the legends, the demons and gods were engaged in a war to gain possession of Amrita, believed to be the elixir of eternal life. Lord Vishnu, while transporting it in a kumbha (pot) for safe guarding, spilled drops of it at four places, known to us as Haridwar, Nasik, Prayag and Ujjain. These thereafter, went on to become the locations for the festival. The Kumbh Mela is held in each of these cities on the banks of the rivers Ganga, Godavari, Sangam and Shipra, respectively, every three years, rotating between these four locations. However, the Purna (complete) or Maha Kumbha Mela takes place only after every 12 years by rotation in one of those four places. The most recent Maha Kumbh Mela held in 2013 in Prayag (also known as Allahabad) became the largest religious gathering in the world with almost 120 million visitors. The next will be held now in 2025. The exact Maha Kumbh Mela dates will only be decided according to Hindu astrology and planetary movements. But for those of you wanting to take a holy dip earlier, the heartening news is that an Ardh (half) Mela (festival) takes place six years after the Maha Kumbh in Prayag and Haridwar. The Prayagraj Ardh Kumbh Mela is already underway in Allahabad (Prayag) starting on 15th January until 4th March, 2019. The banks of the Triveni Sangam, a confluence of three rivers — the clear waters of the Ganges, the Yamuna with its greenish hue and a third invisible river, the Saraswati will come alive with the festivities. The government of Uttar Pradesh believes that ‘the Vedas say that there is nothing incomplete in the Hindu religion. Everything is complete in its own sense and therefore, the word ‘Ardh’ doesn’t gel with the philosophy.’ Based on this, the word ‘Ardh’ has been dropped and the mega religious congregation is simply named Kumbh Mela 2019. 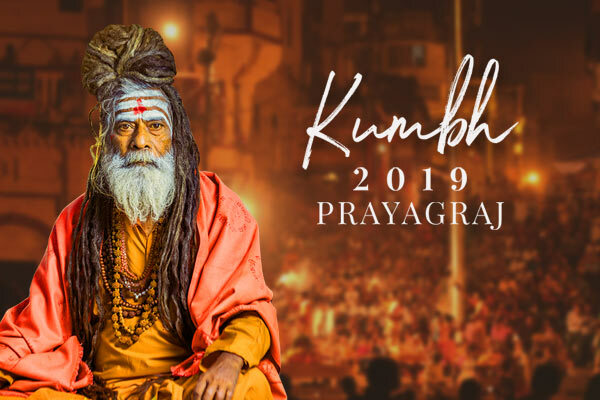 Check out the Kumbh Mela schedule here and plan out the day you wish to queue up (way before the sun rises) for a dip in the sacred waters and absolve yourself of your past sins. Some of the other stunning highlights that mark this festival are by themselves extraordinary experiences that must not be missed. Shahi Snan (Royal Bath) is the holy bath that is taken by the Saints of different Akharas (religious groups) in the sacred river before any other Hindu pilgrims. The Kumbh Mela schedule will help make sure that you can plan your trip so that you can catch this event. The other event you will not want to miss is the Akhara or Peshwai Procession. This royal procession – led by the Naga Sadhus riding on elephants and horses bedecked in elaborate finery to take the Holy Dip at the Sangam is a breath-taking sight. Not to mention the acrobatic, martial arts and sword performances by the sadhus. Plan your trip so that you can be part of this grand and vibrant event. The city of Allahabad also has many historically significant tourist attractions. So, if you feel like a break from the hustle and bustle of the Kumbh Mela, you can explore these ancient temples and monuments. If reading about this grandiose festival has evoked the desire in you to be part of the millions descending on the Prayagraj Ardh Kumbh Mela, then you need to act fast. One glance at the Kumbh Mela schedule and you will realize you can easily miss being there. But don’t panic! Thomas Cook has made your Kumbh Mela booking a cakewalk with a range of packages. These packages make sure, that no matter how little, or more time you can spare, you will not miss out on this spiritual experience. In designing these packages Thomas Cook has left nothing to chance. Whether, you decide to arrive by Air or Rail, you do not have to lose precious time figuring your way to the festival. Thomas Cook will ensure that you are received and taken straight to the Kumbh Mela. 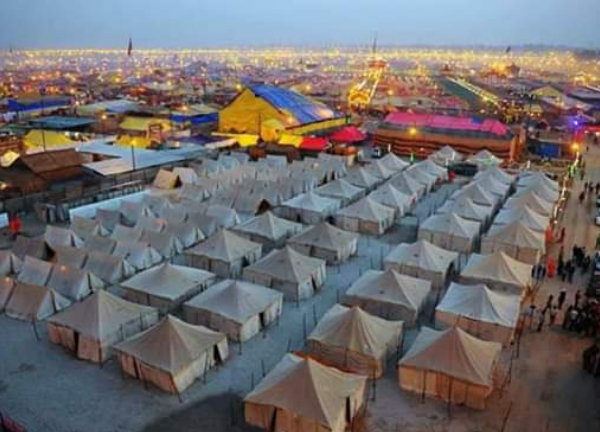 Your accommodation will be in the proximity of the Mela in comfortable Kumbh Camping Tents or in a similar (Standard) Deluxe Camp. A choice of Vegetarian Indian, Continental and Chinese fare will ensure you are well nourished to take on the rigours of the festival activities. In your leisure time, after your finish exploring the Mela and take the Holy Dip, you can enjoy a variety of activities at the camp. Unwind physically and emotionally by doing yoga and meditation. Pamper yourself with Ayurvedic massages and relaxation therapies. Soak in the religious essence of the festival by attending a recital of hawan and chants or a self-realisation course. You can even try your hand at learning about palmistry and horoscope. There are even fun Indian cooking classes. And a daily bonfire with traditional folklore where you can catch up and bond with fellow pilgrims. Choose from any of the carefully customized special packages that give you the flexibility to experience the Kumbh Mela in your own personal way. If a night is all you can spare from work then this package will ensure your day is well spent at the festival. After your arrival, Thomas Cook without further ado, will make sure that on this very same day you partake of the Holy Dip in the Sangam. Later in the evening you can relax and explore your surroundings before departing from Allahabad city the next morning. Even though it’s only a day, Thomas Cook will ensure that you make a lifetime of memories with this trip. If you want a richer experience of the Mela, and yet can only get away for a day or two, then this package is all you need. Straight from the Airport/Railway Station you will travel to the Kumbh Mela location, giving you time to catch some lunch and take in your surroundings. In the evening, get prepared to be treated to an informative guided exploration of the Mela. Early next morning you will proceed to Sangam for the Holy Dip. You can spend the rest of the day exploring the various activities available in the camp. Then again, on your last day, you may simply choose to sit back and relive the spiritual experience of the day. This package is customized so that you can experience all the significant events in the festival. After your arrival at the camp you can spend time relaxing and enjoying your surroundings before setting out in the evening on a guided walk of the Mela. The next day you spend catching the stunning spectacle of the Shahi Snaan and the grand Akhara Procession. Then comes the moment you are waiting for, taking the Holy Dip in the Sangam. Spend the evening relaxing or participating in activities in and around the camp. One never knows when you will venture this way again. The next day is dedicated to enjoying the local tourist attractions. Visit the mesmerising Allahabad Fort. Go back in time, exploring the ancient Patalpuri, Akshayavat and Hanuman temples. Discover the timeless antiques in the Museum and soak in the bygone romance of Khusro Bagh. Thomas Cook makes sure in this package that you will be taking back a trove of priceless memories with you from this trip. With this special customized package, you will be one of the rare few who will have experienced the Kumbh Mela in all its possible hues and shades. In addition, to all the activities of the previous 3 Nights/4 Days tour package, you will have the privilege to actually interact with various Sadhus. You may just be lucky enough to take back some selfies with some famous Nagas and Akharas. You will also, witness the beautiful Aarti ceremony (Worshipping of Holy River) on the banks of the Sangam. The pace has been planned so that you can participate in the various cultural events at the Mela and explore all the activities in the camp. You will take back much more than spiritual fulfilment from this trip. We all seek Nirvana, but at this Kumbh Mela it is going to come to only those who do not waste a moment in making their Kumbh Mela booking. Try not to miss this opportunity, as it will be a bit of a wait until the next Maha kumbh mela dates in 2025. Visit the Thomas Cook website and make your Kumbh Mela booking now. Here’s to a pilgrimage of a lifetime! World’s largest peaceful gathering – Kumbh Mela, a mass Hindu pilgrimage of faith in which people from not only India, but from across the world, gather to bathe in a sacred or holy river. Kumbh Mela locations – the festival is held in four locations, mainly, Haridwar, Nasik, Prayag and Ujjain. Prayagraj Ardh Kumbh Mela – the Prayagraj Ardh Kumbh Mela is scheduled to be held in Allahabad (Prayag) on the banks of the Sangam. Shahi Snaan (Royal Bath) – the holy bath that is taken by the Saints of different Akharas (religious groups) in the sacred river before any other Hindu pilgrims. Akhara or Peshwai Procession – a royal procession led by the Naga Sadhus on decorated elephants, camels, horses and vehicles to take a Holy Dip at the Sangam.